Your App Startup is Dead. Long Live Your App Startup. I’ve never met Fred, but as an early-stage investor I read everything he writes. 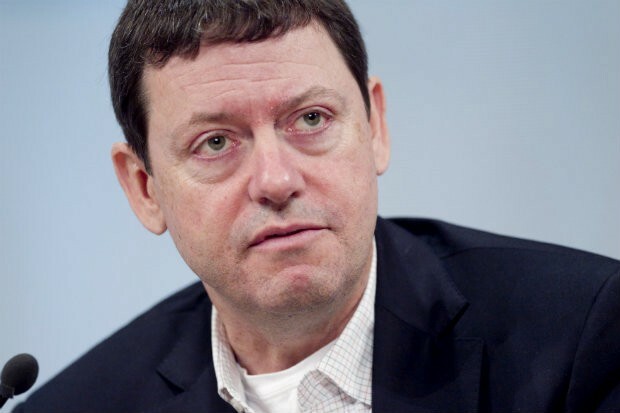 (I came close to meeting him once — I was in USV’s offices in the early days, on a Monday in 2005, the morning after I ran the NYC Marathon, pitching Brad and then-analyst Charlie O’Donnell on a startup that ultimately became Viewbix — but Fred wasn’t in that day.) 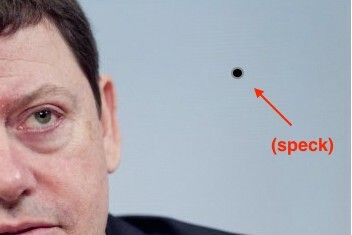 He’s clearly got much more in terms of wisdom, experience, track record, following, etc. than I do. Or something like that. So yes, mobile-first, mobile-only, blah-blah-blah, but the giant apps are taking and will continue to take the lion’s share of that mobile-first, mobile-only consumer time, attention, and revenue and your piddly, poorly-funded new consumer-facing app is going to have a Sisyphean, near-impossible uphill climb to gain any kind of traction. Hard to argue with that. But I will. If things progress along this path, then yes, getting your new B2C app to traction is less likely than winning the lottery. And that’s why most investors, like Fred, and me for that matter, are very, very wary of investing in a new consumer-facing app that is built on the premise of attracting user time and attention. But a new trend is emerging that might change the dynamic, led by one word: Notifications. While the media industry is abuzz over consumers blocking mobile ads, consumers are showing increasing willingness to allow push notifications onto their small screens. And that applies to all kinds of apps, not just messaging apps. 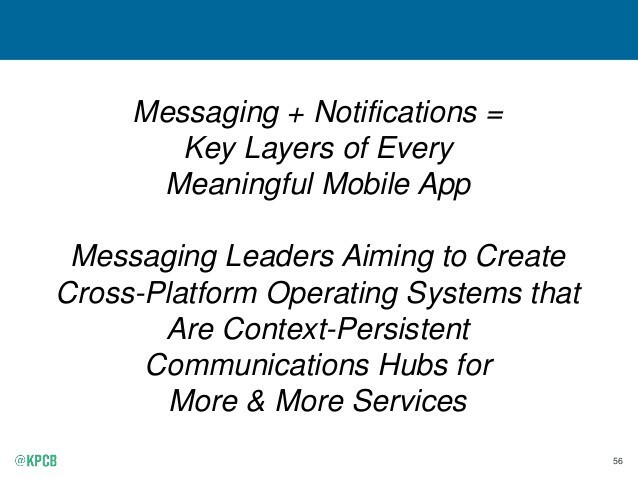 The next wave of mobile-first or mobile-only is driven by notifications. Downloading an app becomes — not always, but often — simply a “permission” to start receiving push notifications from that source. Those apps become less like the “destination” or “heavy-usage” apps of today (which., apparently, we have time, patience and interest in only using 26.5–26.8 of, at any given time) and more like Pages you “like” on Facebook, or people you connect with on LinkedIn, where that connection enables them to send you pings, pokes and notifications from time to time that you peruse and filter. Could it be that there’s a new, emerging category of apps, that expands our willingness as consumers to download, because we don’t use those apps heavily, but simply accept and react to the (hopefully well-timed, or else we’ll delete you) push notifications they send us? 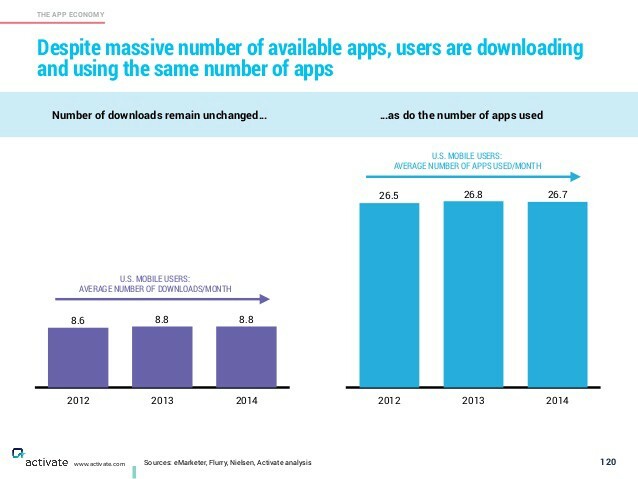 Could this cause us to download apps with greater frequency, expand our “roster” of downloaded apps, even if we still use roughly the same 26.5–26.8 “steady” apps as destination or go-to apps for messaging and other repeat-usage activities? Let’s say I only have 25 day-to-day close social contacts (for argument’s sake — my kids would say I have less), but I certainly have connected with many more people on social media and by virtue of those connections have allowed and enabled them to ping me from time to time with questions or other communications of potential mutual interest. If it gets too annoying or I don’t see the value, I dis-connect. 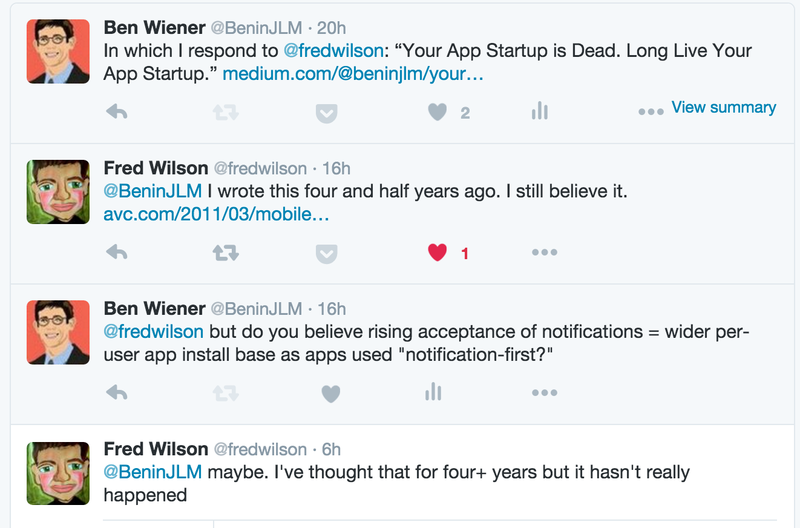 What if our relationship with apps opens up in a similar way, with notifications as the key? I don’t know. But at Jumpspeed, while I still angle much more heavily towards B2B, I’ve invested in a handful of consumer-facing mobile technologies that are all based in one way or another on enabling notification-triggered consumer interaction rather than relying on heavy, repeat, “destination” usage. So I’m not saying Fred is wrong. He’s right based on the current dynamics and figures. But I wonder if we’re on the cusp of a change or an era of expansion in the way consumers interact with their smart devices, and consequently, a paradigm shift in the willingness of consumers to “connect” with additional apps. As Fred says, hope springs eternal. @BeninJLM. Rare Medium posts, hopefully well done.